kissing frogs. : race recap: eastern states half marathon! race recap: eastern states half marathon! With the whole trip to the west coast and then not sleeping for five days upon my return, I forgot that I ran a half marathon not too long ago! Eastern States is a pretty small race compared to what I'm used to. It's a 20 mile tune-up and for the half marathon they bus you out to mile 7, pull you back a tenth of a mile and say GO! There's no official starting line or timing chips, something that I am not used to at all. There were just under 200 half marathoners at this year's race, although I'm sure there would have been more had the weather not been so ominous. The morning went like this: I picked up Liz, we got coffee and gossiped on the drive up to Hampton beach (nearish to the finish line). We stood in the parking lot for about five minutes to decide what clothing we wanted to wear and then we got on separate buses so she could get dropped off at the 20 mile start, whereas I was only running a measly half marathon. Because it was a small race, and because we were basically squatting on their course, we didn't have much at our start. There was a small tent and that's it. The bus driver let us stay on the bus with the heat on because it was fairly cold outside. We were there so early that I actually managed to take a short nap because they needed to turn the bus over to be used for bag check. 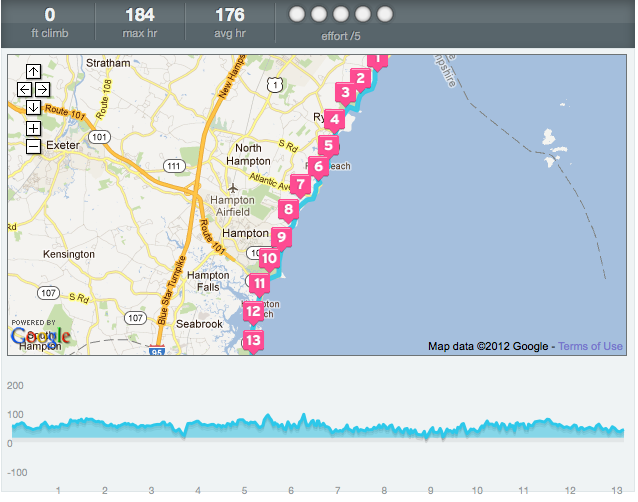 I wasn't very nervous going into this race, mostly because I'd done Hyannis a few weeks prior. I also am trying not to give myself any goals that involve specific time or pace until I get back into good running shape. It's been seven months since my surgery, but some days I still don't feel 100% so I'm trying to cut myself a little slack. Also, the main reason why I did this race was that I was told it'd be pancake flat. And that was pretty much on the money. The (very small) pack started to disperse almost immediately and mile 5 I was pretty much on my own. To be honest, it felt more like a training run than it did a race. Maybe that's why I stayed so relaxed for the entire thing. I entertained myself by picking a person in front of me and trying to pass them. It was a combination of this, and the disgusting amount of Glee songs on my iPod that got me through most of the race. FYI: I was passed by the first runner of the 20 miler at 1:06. They started 7 miles behind us. That means that the lead male runner was literally going TWICE as fast as me. How's that for humbling? The course was beautiful. 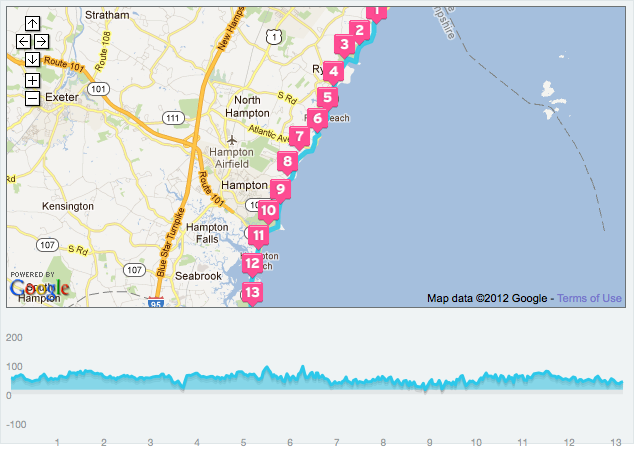 We ran almost the entire race on the coast of New Hampshire and Massachusetts. Had the weather been a little nicer, it would have been a perfect course. See? I felt pretty solid for almost the entire race. Around mile 11.5-12 there was a drawbridge and it felt like searing hell. My left (aka good) knee started THROBBING. Really? I have one good knee and it punks out on me less than two miles from the finish? I stopped for a quick second just to massage my patella to see if it would help. It didn't. So I knew that I just had to barrel through it and finish. I wish i had been wearing different clothing - my rain jacket was making me sweat like a beast, and I did not like it. Also, we were at the race so early, which means I ate my breakfast early. I finished the race feeling HUNGRY, and that's never happened to me before. I crossed the finish line at 2:20:08, or a 10:41 pace. It's not fast, by any means. But it's my second fastest half marathon out of the nine I've done, and I'm proud of how I ran the race. I know it's not the best I can do, but it's the best I can do right now. But, I don't think you can expect much more from yourself than doing your best, right?